Carlton’s forward line will be in safe hands, with Darcy Vescio joining the Blues women’s team as a marquee player. The 22-year-old full forward currently plays with the Darebin Falcons, which is touted as the most successful women’s team in Australia. Vescio, who started playing footy when she was five, is a three-time premiership player with the Falcons and has represented the Victorian state team on two occasions. After being selected with pick three in the 2014 draft, Vescio has played for the Western Bulldogs for the last two years. She is known for her clean hands and regularly puts herself in dangerous positions, making her a handful for opposition defenders. Vescio works at Carlton three days a week as a graphic designer, and is fittingly working on the design for the inaugural women’s guernsey. Is she a free agent? THEY LIKE TO SEND UP!!!!!!!! Until each team plays each other the same number of times, the AFL, as a fair dinkum competition, cannot be taken seriously. He (Mr Swann) said the honour and pride associated with the club's traditional navy blue jumper was priceless. Apparently Cane Kornes has tweeted she wants a clearance to Fremantle. "Hence you will not say that Greeks fight like heroes but that heroes fight like Greeks"? Too much Sugar and too much Bleach is very very boring. As Darcy was responsible for designing the club's women's guernsey, she has to held at least partly accountable for the inclusion of the light blue strips on said guernsey. Why the Club would allow this to go through, beats me. I think this is a really important issue. Never argue with idiots. They drag you down to their level and then beat you with experience!!! Only for those interested/concerned about what colour(s) the club's guernsey incorporates. Apparently the light blue stripes were made from wild bovine. No. That'd be the light blue tripes. hree teams had two representatives. Collingwood had Emma King and Nicola Stevens, Carlton had Darcy Vescio and Brianna Davey while the Western Bulldogs had Ellie Blackburn and Emma Kearney. Melbourne skipper Pearce was named captain of the All Australian team, with Crows co-captain Phillips her deputy. 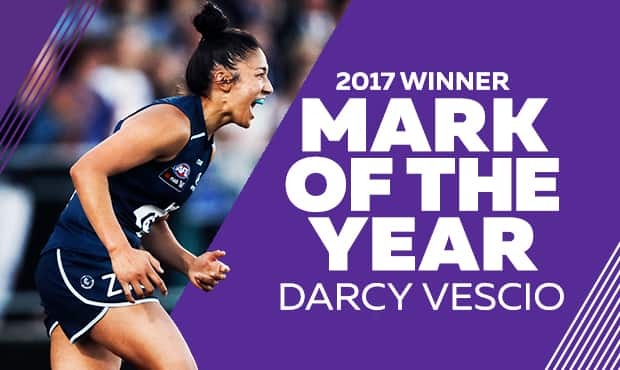 Vescio's brilliant grab versus the Western Bulldogs in round five saw her take out the Woolworths Mark of the Year with 36 per cent of fans' votes on AFL.com.au. The Blues star cleaned up on the night after also taking home the prize for being the season's leading goalkicker, with 14. Didn't finish as high in the B&F as I expected, given the season she had. In my Uber driving I picked up Darcy after the Essendon* game earlier in the season. It was very surreal to pick up a new footy star. The trip was short, but she was very delightful. She loved the season and loved playing for the Blues. I am sure she will stay. I had two other players in the back as well, but have forgotten their names. One was a vice captain. I see we had two. They all had their Blues clothing on and had been barracking hard. That was very good! Kudos to the club and all the family members involved!